The risk of an ischemic stroke rises after people have suffered a traumatic brain injury, according to a new study by researchers at the University of Michigan. The findings are of concern to anyone who suffers a traumatic brain injury, including those who are injured in a workplace accident. The study, published in the journal Neurology, found that people had a traumatic brain injury had a greater risk of stroke in the 28 months after the injury than those in a control group of people who had suffered trauma but no brain injury. The study was based on an analysis of 1.37 million patients from a database between 2005 and 2009, including 37 percent who had suffered a brain injury. Among those with a brain injury, 1.1 percent later suffered a stroke, compared with .09 percent in the group that had suffered no brain injury. That translated into a 31 percent greater risk of stroke among brain injury patents. 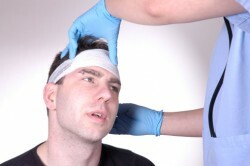 The average age of people in the study who had suffered traumatic brain injury was 49.2 years. People of that age are not typically at a higher risk of stroke. Stroke is a debilitating condition that can lead to long term or permanent disability. There may be impediments not only in cognitive function, but also in language and speech as well as physical functions and motor skills. A worker who suffers a stroke is almost certain to suffer a dramatic reduction in income as a result.